Crucifixes, showing the agonized body of Jesus as he hung on the cross, were created across Spanish America and could have been seen in houses, churches, and on the street during religious processions. This one was made and most likely used in Bolivia. The maker has carved the cross to look like branches of a tree, a reference to the biblical Tree of Life. 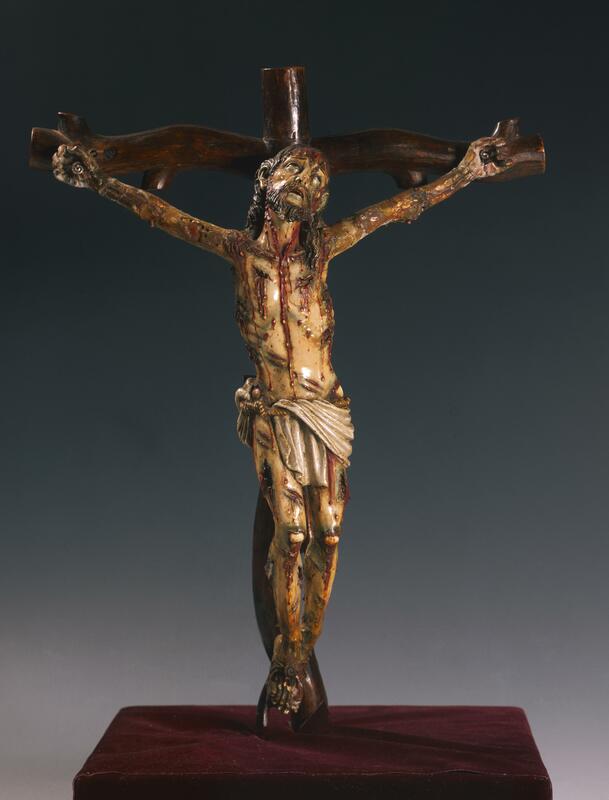 In picturing Jesus looking upward, with lips parted, the artist sought to capture the biblical narrative of the crucifixion where Jesus asks, “My God, my God, why have you forsaken me?” The bloodiness of this image is typical of crucifixions from both Spain and Spanish America. The horrors of Jesus’ ordeals—the marks of nails and wounds graphically portrayed—were thought to stimulate empathy and stir powerful emotion among those who viewed such works. While the name of the person who made this work is no longer known, the carver was skilled in dramatic representations. The image resembles ivory carvings of the same subject, imported into Spanish America from the Philippines and east Asia; this suggests the carver knew those more expensive works. The wood of the cross was probably local cedar, a wood used widely in the Andes. The body of Jesus was sculpted from maguey. Originally worked by indigenous people, maguey became an important substance for religious imagery in colonial Bolivia. Although more perishable than wood, maguey was inexpensive and accessible. And it may have been chosen to emulate the imported Asian ivory images of Jesus on the cross that, for the most part, were quite costly. Little is known of the history of this piece, but its small size suggests it was made for private devotion in an elite home. Today it is part of the municipal collection of the city of La Paz, Bolivia. During Holy Week, penitents carried large versions of crosses like this one in imitation of Jesus’ trials, literally bringing crucifixes like this to life. 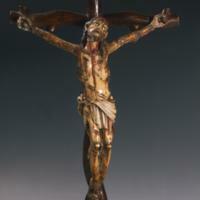 In a private home altar, a crucifix like this one was meant to focus the viewer’s attention onto the sufferings of Christ. The use of local materials in Christian sculpture, like the maguey in this crucifix, is not limited to Bolivia. Across Spanish America, indigenous materials were employed to serve the needs of colonial, Catholic patrons. In its material and iconography, this crucified Christ, although a unique creation, evokes both religious and artistic practices common to Spanish American experiences. Christian, William. 1992. Moving Crucifixes in Modern Spain. Princeton: Princeton University Press.